What is another word for reconstruct? breathe new life in to. 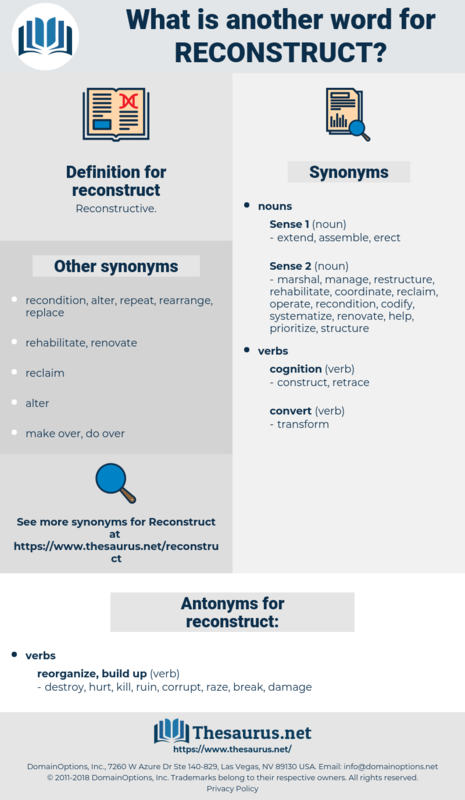 rehabilitate, restructure, replenish, recover, renovate, revive, regain, regenerate, reinstate, renew, reinvent, repair, remold, relaunch, transform, revamp, retrace, redo, remake, trace, refurbish, reestablish, remediate, restart, mend, erect, reactivate, reshape, rewrite, reprovision. reconstitute, restore, re-establish, recreate, redevelop, reconstruction, rebuild. destroy, hurt, kill, ruin, corrupt, raze, break, damage. According to his preposterous theory, you could in conversation with a woman reconstruct the last man who had made an impression to her. I know scientific men among my personal friends who are simply incapable of being hospitable to an idea that would compel them to reconstruct a theory that they have already accepted. hypothesize, speculate, theorize, theorise, hypothecate, suppose, conjecture, hypothesise.